From visionary writer/director Guillermo del Toro (director of BLADE II, THE DEVIL'S BACKBONE) comes HELLBOY, a supernatural action adventure based on Mike Mignola's popular Dark Horse Comics series of the same name. Born in the flames of hell and brought to Earth as an infant to perpetrate evil, Hellboy (Ron Perlman) was rescued from sinister forces by the benevolent Dr. Broom (John Hurt), who ra… ised him to be a hero. 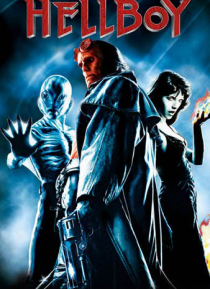 In Dr. Broom's secret Bureau of Paranormal Research and Defense, Hellboy creates an unlikely family consisting of the telepathic "Mer-Man" Abe Sapien (Doug Jones) and Liz Sherman (Selma Blair), the woman he loves who can control fire. Hidden from the very society that theyprotect, they stand as the key line of defense against an evil madman who seeks to reclaim Hellboy to the dark side and use his powers to destroy mankind.